The spread called “Nuttvia,” contains no palm oil and has a 5-star health rating. Nuttvia has been certified with the Orangutan Alliance No Palm Oil Seal. Maria Abadilla from the Orangutan Alliance said the alliance was pleased Nuttvia is palm oil free. “Our aim is to empower consumers to decide with their buy and to promote Palm Oil Free products, and Nuttvia fits in perfectly,” she said. 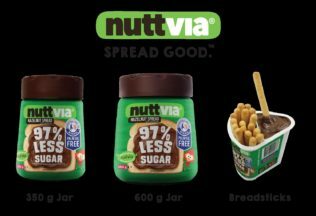 Nuttvia is available now through Coles supermarkets across Australia. It will also be sold in New Zealand, the United Kingdom, the United Emirates, Hong Kong, Korea and in several countries in Europe. The spread is available in 600g jars, 350g jars and in a breadsticks snack-pack. Paul Newman’s Own has released two new salad dressings for summer, Zesty Italian and Coleslaw. Coca-Cola South Pacific has announced a new summer marketing campaign for its Fuze Tea beverage.